On 5 February East London Dance’s over 65s dance class Leap of Faith performed in a showcase with Dance to Health groups as part of Aesop‘s first national Arts in Health Conference & Showcase. 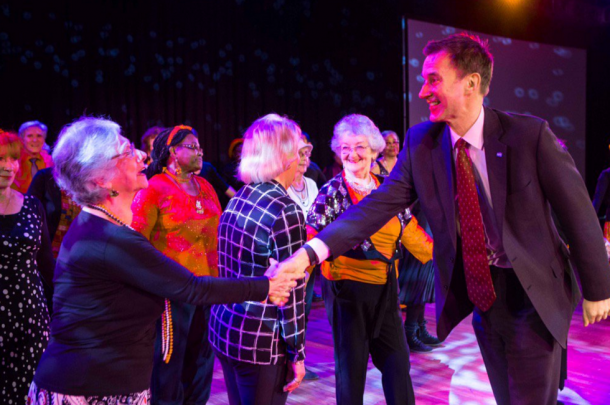 The conference was held at the Southbank Centre and brought together senior figures in health and the arts including Secretary of State for Health Jeremy Hunt and chair of Arts Council England Sir Peter Bazalgette. The conference sought to showcase and champion the use of arts in health and social care, with programmes as diverse as shared reading groups for good mental health to magic intensive therapy that uses adapted magic tricks to aid recovery from hemiplegia, a stroke or brain injury. Leap of Faith and participants of the Dance to Health classes run in partnership with AmicusHorizon Housing Association and Jewish Care put in an energetic performance to represent the Dance to Health programme, which is an evidence-based falls prevention programme that improves strength and balance whilst also providing creative and social opportunities for older people. The performance, choreographed by Jennifer Irons, was a great way to show the life of the programme. It included dancing on chairs, a variety of props and a disco ball, proving that health exercises needn’t be mundane. Even the Secretary of State got to his feet afterwards to personally congratulate the dancers.